Landslides are a large risk in elevated parts of the United States, such as the Appalachians, Northwestern United States, and Southern California. Landslides claim a billion dollars in property damage and cause 25 deaths each year. 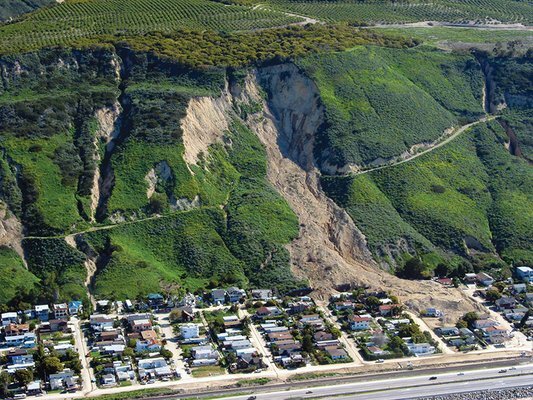 La Conchita, California has a history of landslides. The landslide of 2005 was the most devastating. That landslide destroyed thirteen homes and killed ten people. The families of the deceased sued La Conchita City and La Conchita Ranch Co., a ranch on top of a hill overlooking the residences. The jury determined that the city was not liable, but La Conchita Ranch was fifty percent liable because they failed to install a proper drainage system which would have diverted some of the rain water. $5 million was divided between thirty-six plaintiffs. In 2005, 300 feet of rocks and debris collapsed onto Poppy Trail residence area. The retaining wall holding back the rocks was eroded after a winter of heavy rainfall. Roadways were blocked, cutting off passage to nearby houses. Residents were forced to use all-terrain vehicles to access their multimillion dollar homes. The slide also resulted in a guesthouse hanging over the edge of a small cliff. If the cliff had collapsed, the guesthouse would have fallen on top of the other houses. The owner of the guesthouse refused to repair his property, but subsequently disappeared from the state. In the end, a settlement was reached. Two new driveways were constructed and the hanging cliffside guesthouse was demolished. Residents received $40,000 in damages each. In 2006, 70 Bolsa Avenue was destroyed by a mudslide. Walter Guthrie was removing debris around his house when it happened. He was crushed to death when an avalanche of mud came down after hours of rain. His widow, Lisa Guthrie, sued the city for property and personal damage because the city knew about the dangerous conditions of the hill overlooking the Guthrie house, but failed to act. The jury awarded $4.8 million as a result. Since the jury also found contributory negligence on Walter’s part, the judge lowered the final award to $4 million. However, it is still difficult to find fault with a man who was trying to save the house he and his family had lived in for thirty-five years. « Can I Get Fired for Smoking Marijuana?